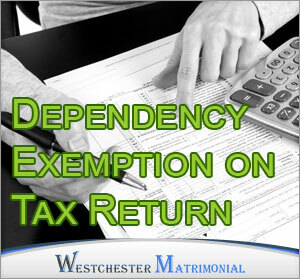 Home > Cusody/Child Support > Who Claims The Dependency Exemption On The Tax Return? Who Gets The Dependency Exemption On The Tax Return? As parents negotiate child custody and support agreements they are faced with many decisions. The biggest decisions usually revolve around custody, visitation, and child support, but there are smaller, less obvious issues that are best decided at the time of the agreement, too. One of these is the IRS Dependency Exemption that parents are able to take if they have dependent children. This exemption is easy to overlook in child support agreements, but it can have an effect on your finances for years to come since parents are generally eligible to take the credit until a child is 19 years old. When taxpayers file a tax return they can claim their children as dependents under IRS rules. Your actual dependency exemption may vary, but the standard exemption amount was $3,900 per child in 2013. Exemptions directly reduce your taxable income for the year. This particular exemption phases out if the parent makes more than $250,000 per year. In situations where one parent phases out of the exemption, the exemption can go to the other parent. The dependency exemption is different from the Child Tax Credit. The tax credit is only available for children under 17 years of age and starts to phase out at $75,000 for a single filer. Also, since it’s a credit, it does not reduce your income. Rather, the credit allows you to subtract $1,000 per child from the amount of taxes you owe. The credit is capped at $3,000 and you can only claim the tax credit if you also claim the child as a dependent. Trouble arises when both parents want to (or try to) claim the exemption and the credit on the same child. IRS law does not allow this. Only one parent can claim the exemption and credit. As you can imagine, many ex-spouses clash over who gets the exemption and credit and, unfortunately, the law is not clear-cut as to who is entitled to them. Exactly who will receive the dependency exemption and the child tax credit is something that can, and should, be negotiated as part of the support agreement. There are many ways parents can approach this issue. Some choose to let the custodial parent claim the exemption. Some allow the parent who pays more in child support to receive the exemption. Others alternate who receives the benefit from year to year or if more than one child is involved, each parent can claim one or more of the children. Whatever arrangement works best for you, it’s always a good idea to get it settled and in writing before tax time, either as part of your support agreement or as a stand alone agreement. If both parents try to claim the same child, you can both get audited. In general, a parent paying full child support is entitled to claim the child under the dependency exemption. However, child support payments must be current. If you are behind on payments or only paying a portion of the payments, you should not claim the exemption. Another thing to keep in mind is that the courts always have the discretion to allow the custodial parent to claim the child as dependent, even if the other parent is paying full child support. This is particularly true if child support payments are very, very low and not considered enough to fully support the child. It’s important to talk to your accountant and think through the tax consequences of taking exemptions and credits before claiming them. In some cases, they may not make sense for you or the exemption amount may not be worth the fight with your ex-spouse. It’s almost always better to come to an agreement without involving the courts. If the court system has to make the decision for you, they will likely base the decision on the tax consequences alone. This may mean that a mother with full custody, for example, has to give up the exemption to the father who pays child support but does not have custody of the child. But, if both parents work and provide support, it is most likely that the courts will decide to alternate. Parents who opt to waive their right to claim the exemption or credit must sign IRS Form 8332. This form allows the non-custodial parent to take the child as an exemption. If this is something you and your spouse agree on at the time of the agreement, be sure to get it signed. That way, if things change down the road, you already have the signed document in hand. The fairest solution may just be to alternate who gets to claim the child each year. That way, each parent receives the benefit and neither is excluded. * This article is not intended to serve as tax advice. Always consult your accountant before making any tax-related decisions.